The new season of Game of Throne is coming closer. They will release the first episode in the middle of April 2019. 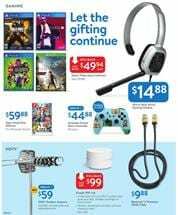 If you are a fan of the show and don't like your current TV, I recommend you to see the deals and product range of Walmart electronics on pg 15. HBO's popular show deserves a 4K TV for its outstanding visual effects and exciting plot. You can replace your current TV with something new or pay only $498 for TCL Roku 65" Class 4K TV. Also, see smartphones like Alcatel Tetra or AT&T Prepaid, LG Phoenix 4 on AT&T prepaid, and more options can be seen there. Upgrade your gear video gaming at Walmart. PS4 or Xbox Wired gaming headset will improve the connection between you and your teammates. Most of the shooter games require uninterrupted voice chat for successful results. If you are playing some game with a battle royale mode, these are the perfect kind of headsets to be able to communicate properly. Console games like Hitman 2, Assassin's Creed Odyssey, Call of Duty Black Ops 4 are only $49.94 each. Nintendo Switch retro controller is also available at Walmart. You may also find the office and working electronics like printers, HP laptops on pg 18. Weekly Ads 2019 | Contact | This address is where you can find featured ad of stores like CVS, Kroger, Publix, Walmart, Meijer, Albertsons & ALDI and Target.